But in the middle, there is an argument which caught my eye, and I thought it worth reproducing. Basically the starting point is this chart, which if you haven’t seen by now (or something like it) I’m not sure where exactly you’ve been during the last 2 or 3 years. 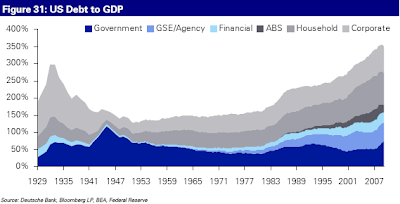 As can be seen (from the above chart) there was a step change in the US economyâ€™s indebtedness from the early 1980s onwards and then an additional one in the late 1990s/early 2000s. A similar picture is apparent across most of the Western World. Basically from the early 1980s to the onset of the Global Financial Crisis the economy added on more debt every year and business cycles were extended as a result. Indeed the Fed and Central Banks around the world were afforded the luxury of operating in a secular falling inflation regime (globalisation) that allowed them to cut rates, further allowing the accumulation of debt, every time the economy may have naturally been rolling over into a normal recession consistent with those seen through history. This debt accumulation undoubtedly helped smooth the business cycle and contributed to the period being known as the â€˜Great Moderationâ€™. This period came to a spectacular end with the onset of the crisis and it is possible that going forward we will revert to seeing business/credit cycles more like they were prior to the â€˜Great Moderationâ€™. Now here comes the clever part. Our researchers then go on to take a look at the the average and median length of the 33 business cycles the US economy has seen since 1854. For the overall period they found the average cycle from peak to peak (or trough to trough) lasted 56 months (or 4.7 years). However, the averages are boosted by an occasional elongated “superbusiness cycle”, and thus the median length is a much smaller 44 months (3.7 years). As they comment, such numbers must look very strange to those who have only ever analysed business cycles over the last 25-30 years. Within these 33 cycles the contraction period lasted 18 months on average or 14 months in terms of median length. This equated to the economy being in recession 31% or 32% of the time depending on whether you look at the averages or the median numbers. Taking just the period before the â€œGreat Moderationâ€ the average US cycle lasted 5 months less at 51 months (or 4.3 years) with the median at 42 months (3.5 years). Over this period the US economy was in recession 35% and 36% of the time respectively depending on whether you look at averages or the median. Now we used to think that all of that was behind us, but then we used to think that the “Great Moderation” had gotten things under control, and not simply temporarily extended the cycle length by facilitating long-term-unsustainable levels of indebtedness. So in fact, given that, as they say some sort of cycle or other has been with us since at least biblical time, what we might now expect are more “normal” cycles (in historical terms), which put a little better means shorter ones with more frequent recessions. “Given all we know about the â€˜debt supercycleâ€™, it is likely that the onset of the Global Financial Crisis ended the â€œGreat Moderationâ€ period. Unless we find a way of continually adding more debt at an aggregate level in the Developed World it is likely that we will see much more macro volatility and more frequent business cycles going forward. Given the fact that Developed World Government balance sheets are under pressure, and given that interest rates around the Western World are close to zero, the post-crisis ability to fine tune the business cycle is extremely limited. We may need to put an immense amount of faith in the experimental force of Quantitative Easing to deliver economic stability. This will be an experiment with little empirical evidence as to how it will turn out. For now the base case must be that we revert more towards business cycles more consistent with the long-term historical data”. Now, without dwelling on the gory details, if we look at the spread between the upside, median, and downside cases, we could pretty rapidly come to the conclusion that the next US recession has a high probability of starting sometime between next summer, and the summer of 2012 – which, as you will appreciate, isn’t that far away. I am also pretty damn sure that Ben Bernanke and his colleagues over at the Federal Reserve appreciate this point only too well, and hence their imminent decision on more easing, since a recession hitting the US anytime from next summer will really come like a jug of very icy water on that very fragile US labour market, not to mention the ugly way in which it might interact with the US political cycle. I think the mistake many analysts are making at this point is basing themselves on some sort of assumption like, “if the recession was deep and long, then surely the recovery should be just as pronounced and equally long”, but, as the DeutscheBank authors bring to our attention, business cycles just don’t work like that. Now, why I think this is an interesting argument is that the starting point for looking at the recovery is rather different from the norm, in that instead of peering assiduously at the latest leading indicator reading, they do a structural thought experiment, and work backwards from the result. Now, one thing I’m sure Ben Bernanke isn’t is stupid, so it does just occur to me that either he, or someone on is team, is well able to carry out a similar kind of reasoning process. In fact, it would be an understatement to say that the forthcoming QE2 launch is causing a great deal of excitement in the financial markets. As the news reverberates around the world, it seems more like people are getting themselves ready for some kind of “second coming”. Right in the front line of course are the Europeans and the Japanese, and the yen hit yet another 15 year high (this time of 81.11 to the dollar) during the week, while the euro was up at 1.4122 at one point. Greeks, where are you! Can’t you engineer another crisis? We need help from someone or we will all capsize in the backwash created by this great ocean liner as it passes. With this prospect as the background, it should not come as a surprise that talk of currency wars and competitive devaluations is rising by the day. Japan only last week threatened “resolute action” against China and South Korea, Thailand has placed a 15% tax on bond purchases by non resident investors, and central banks from Brazil to India are either intervening to try and keep their currency from rising too fast, or threatening to do so. And the seriousness of the situation should not be underestimated. Many have expressed disappointment that the recent IMF meeting couldn’t reach agreement, and hope the forthcoming G20 can do so. But really what kind of agreement can there be at this point, if the real problem is the existence of the ongoing imbalances, and the inability or unwillingness of the Japan’s, Germany’s and China’s of this world to run deficits to add some demand to the global pool. Push to shove time has come, I fear, and if this reading is right then it is no exaggeration to say that a protracted and rigourously implemented round of QE2 in the United States could put so much pressure on the euro that the common currency would be put in danger of shattering under the pressure. Japan is already heading back into recession, as the yen is pushed to ever higher levels, and Germany, where the economy has been slowing since its June high, could easily follow Japan into recession as the fourth quarter advances. Indeed, I think we can begin to discern the initial impact of the QE2 induced surge in the value of the euro in the August goods trade data. 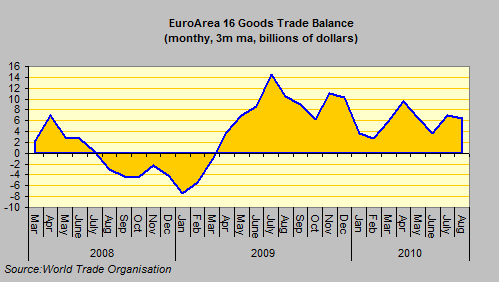 The EuroArea 16 have been running a small external trade surplus in recent months, and to some extent the surplus has bolstered the region’s growth. It is this surplus that is now threatened by the arrival of the QE2. The first flashing red light should have been the news that German exports were down for the second month running in August, but now we learn from Eurostat that the Euro Area ran a trade deficit during the month. “The first estimate for the euro area1 (EA16) trade balance with the rest of the world in August 2010 gave a 4.3 bn euro deficit, compared with -2.8 bn in August 2009. The July 20102 balance was +6.2 bn, compared with +11.9 bn in July 2009. In August 2010 compared with July 2010, seasonally adjusted exports rose by 1.0% and imports by 1.8%”. Basically the eurozone countries had been managing to run a timid trade surplus (see chart below, which is a three month moving average to try and iron out some of the seasonal fluctuation) and this had been underpinning growth to some extent. Now this surplus is disappearing, and with it, in all probability, the growth. Maybe we won’t get a fully fledged “double dip” in the short term, but surely we will see a renewed recession (and deepening pain) on the periphery and at the very least a marked slowdown in the core. At the same time, a number of developed economies like Spain, the United States, the United Kingdom became completely distorted during the years preceding the crisis. Their private sectors got heavily into debt, their industrial sectors became too small, and basically the only sustainable way out for them is to run current account surpluses to burn down some of the accumulated external debt. Traditionally the solution to this kind of problem would be to induce a devaluation in the respective currencies to restore competitiveness, but in the midst of an effectively global crisis doing this is very difficult, and only serves to produce all sorts of tensions. As Krugman once said, “to which planet are we all going to export”. At the same time, two of the world’s largest economies – Germany and Japan – have very old populations, which effectively means (to cut a long story short) they suffer from weak domestic demand, and need (need, not feel like) to generate significant export surpluses to get GDP growth and meet their commitments to their elderly population. The very existence of these surpluses also produces tensions, and demands for them to be reduced. But this is just not possible for them, and Japan is the clearest case. For several years Japan benefited from having near zero interest rates and becoming the centre of the so-called global “carry trade”, which drove down the currency to puzzling low levels, and made exporting much easier. Large Japanese companies were even expanding domestic production and building new factories in Japan during this period (a development which had Brad Setser scratching his head at the time, trying to work out how the yen could have become so cheap). Unfortunately I think there is no obvious and simple solution to these problems. As we saw in the 1930s, once you fall into a debt trap, it can take quite a long time to come out again. You need sustained GDP growth and moderate inflation to reduce the burden of the debt, and at the present time in the developed world we are likely to get neither. In the longer term, the only way to handle the presence of some large economies which structurally need surpluses is to find others who are capable of running deficits, but this is a complex problem, since as we have seen in the US case, if the deficit is too large, and runs for too long, the end result is very undesireable. Basically the key has to lie in reducing the wealth imbalance which exists between the developed and the developing world, but this is likely to prove to be a rather painful adjustment process for citizens in the planet’s richer countries, so policy makers are somewhat relectuntant to accept its inevitability. Basically, the structural difficulty we face is that all four major currencies need to lose value – the yen, the US dollar, the pound sterling and the euro – and of course this basically is impossible without a major restructuring of what has become known as Bretton Woods II. The currencies which need to rise are basically the yuan, the rupee, the real, the Turkish lira etc. But any such collective revaluation to be sustainable will need to be tied to a major expansion in the productive capacity of the economies which lie behind those currencies. In fact, the failure to find solutions is increasingly leading to calls for protectionism and protectionist measures. The steady disintegration of consensus into what some are calling a “currency war” is, as I said above, another sign of this pressure. On one level, the move to protectionism would be the worst of all worlds, so I really hope we will not see this, but if collective solutions are not found, then I think we need to understand that national politicians will come under unabating pressure from their citizens to take just these kind of measures. The likely consequence of them succumbing to this pressure, which I hope we will avoid, would be another deep recession, possibly significantly deeper than the one we have just experienced. And, not least of the worries, the future of the euro is in the balance at the present time. The conclusion that one must draw from the analysis of historical business cycles in the US is that US monetary authorities have made a major policy error in pumping credit during the “moderation” for short term political gain. The FRB has lost its credibility as an institution independent from political manipulation. The United States needs a positive net exports, but the appreciation of the yuan has not had much effect on its trade balance in the past. In the United States problems are become structural. For many years, monetary policy has managed to shorten the duration of recessions, but at the same time has led country to bet too on the financial sector, this caused enormous inefficiencies in the manufacturing sector (which got much / excessive loans) difficult to restore today. In a globalized world, where information and knowledge is available to everyone, competitiveness on the price really matter again. But not only for export, even just to sell in the country now. This is a brilliant piece of research. If the Great moderation is helped by new sources of debt, can it be the case that as the Western world might have reach the limit of how much they can borrow, and the deleveraging process has not been completed yet? Can it be the case that until the debt level is brought down to a more sustainable level so that the economy can truly return to healthy growth? The benefit of a falling dollar will arrive slowly, as it has been shown that companies first absorb the benefits/costs of exchange rate movements and move production only gradually. The most obvious short-term effect of a falling dollar is in commodity prices. If oil moves above $90bbl, you’ll definitely have a recession here by next summer. And this will effect the public reception for QE2. The problem with this response is that it will be difficult to dismiss because it will have a great deal of truth behind it: the Fed is consciously trying to make consumption more expensive. Yet wages are unlikely to follow anytime soon. The faith many commentators seem to have in QE seems to be based on an assumption that they have taken into account all the myriad pluses and minuses, calculated how these will interact and play out over time. But no one has done anything of the sort. Wise people will be forced to prepare for the unintended consequences. I see in the graph a surge in debt from 1929 to 1933/34. It has to do with the GDP fall and deflation. From 1935 onwards there was strong growth and a rise in inflation, so this is coherent with the decrease on debt and the clearing of the market. Anyway, I donÂ´t think that debt is the problem, but insolvency. Of course, in an asset bubble there will be finally a surge in bankruptcies, but a great deal of the losses of ones will be gains for others (althoug the gains wonÂ´t be used in real investments for a time). Credit doesnÂ´t cause the cycle, but it is a mere symptom. And I donÂ´t see why the outstanding debt has to remain in the same level through decades. (half way down) some economists still think t here is a negative chance of anymore, but the chance is still always on the rise…. After QE2 the dollar’s value will dissipate to being worth less than a strand of spaghetti. The central bank is debasing the currency. surely part of the increase in debt and the great moderation was the way the debt was funded? The US household swapped rental for ownership and took on mortgages. This made them part of the investment cycle and as a result when short rates rise, their cash flow was crushed and boom turned to bust. Post 1991 recession, securitisation removed that allowing US households to refinance on the way down with little penalty on the way up. This is in great contrast to the UK or peripheral europe, where short rates act as powerful fiscal policy. Corporates also securitised so that they too did not have to sell assets (or fire people) to meet suddenly increased funding costs. All the interest rate risk was transferred to the financial sector, which naturally over-egged it. The extent to which we revert to an old business cycle will be a function of how much we all have to go back to floating rate funding. Great post. Can you please post the DB report so we can indulge on a Sat afternoon? Thanks! In no way will the August trade already show the impact of the recent euro appreciation! I suggest you read some papers about the pass-through of exchange rate movements, it takes a year to show up in export volumes. An option name for Chinese New Year’s Day signifies actually “the very first day of the (excellent) year” (Chinese: (?)?? ?